I, Nephi … was taught somewhat in all the learning of my father; … yea, having had a great knowledge of the goodness and the mysteries of God, therefore I make a record of my proceedings in my days. In 1832 the Lord told the Saints to “seek ye out of the best books words of wisdom; seek learning, even by study and also by faith” (Doctrine and Covenants 88:118). To facilitate this “general and comprehensive education,” the Lord commanded the Saints to establish a “school of the prophets … for their instruction in all things that are expedient for them” (Doctrine and Covenants 88:127). This school helped prepare them to receive an endowment of power in the Kirtland temple and then to preach the gospel throughout the world. Despite Joseph Smith’s unique prophetic calling and divine gift of translation, he also attended this school and sought to educate himself and the Saints in a variety of fields, including ancient languages. Clearly the Lord values instruction in both secular and spiritual knowledge and education from both academic and scriptural texts. The Book of Mormon likewise emphasizes the importance of secular education as a supplement to well-grounded religious faith. One of the very first things that Nephi, son of Lehi, shared about himself was that he was “taught somewhat in all the learning of [his] father” and that the language of his record consisted of the “learning of the Jews and the language of the Egyptians” (1 Nephi 1:1, emphasis added). Brant Gardner has argued that as the fourth son in a wealthy family, Nephi was likely trained in the Israelite scribal tradition of his time. This training would probably have “covered a range of topics, from languages, classic texts, and the interpretation of texts, to public speaking.” Such an educational background potentially explains the sophistication of Nephi’s prophetic writings. Although he often emphasized the “plainness of [his] prophesying,” numerous studies have shown that Nephi creatively wove his plain teachings into a tapestry of poetic parallels, meaningful literary allusions, and extended narrative typologies (2 Nephi 31:2). Like Nephi, other Book of Mormon prophets surely drew upon their formal educations and secular knowledge to help them better serve the Lord. King Benjamin caused that his sons, including his successor Mosiah, “should be taught in all the language of his fathers, that thereby they might become men of understanding” (Mosiah 1:2). It’s also likely that Alma the Elder, as a former priest in King Noah’s court, would have been a man of learning. Naturally, Alma and Mosiah would have shared their knowledge with their sons, who eventually became prominent leaders themselves, after repenting of their sins. For instance, Mormon noted that Alma the Younger was “a man of many words, and did speak much flattery to the people” (Mosiah 27:8). After his conversion, it seems that Alma used these same gifts in preaching and prophesying. Yet instead of resorting to “flattery,” he utilized his literary and oratory abilities to persuade his people to come unto Christ. Alma clearly took great effort to teach his own sons, who in turn educated a succession of future prophetic leaders. Perhaps most of all, Mormon’s education significantly influenced the Book of Mormon. Mormon reported that at the age of ten, he “began to be learned somewhat after the manner of the learning of [his] people” (Mormon 1:2). His later military experience, extensive travel, and scribal training all surely contributed to his ability to abridge the thousand-year history of his people. Undoubtedly, Mormon passed much of this knowledge on to his son Moroni, who completed the record, presumably after years of training under his father. Recognizing that God uses real humans from real places and times to help co-create his scriptures may explain, at least in part, why He encouraged the early Saints to “seek learning, even by study and also by faith” (Doctrine and Covenants 88:118). Students of the scriptures can learn much about these sacred texts and the prophets who wrote them by diligently studying the best books of science, history, literature, philosophy, and other fields of knowledge. Elder Russell M. Nelson described secular education as a “vital component of wisdom.” President N. Eldon Tanner taught that “man should strive all his days to increase his intelligence and learn all the truths he can” and that “the gospel of Jesus Christ embraces all truth wherever it may be found.” By faith-guided study, one can better comprehend what the scriptures mean and why they were written the way they were. By study-guided faith, these important truths can then be deeply planted and diligently applied in the hearts and lives of those who believe. Hugh B. Brown, “After High School, What?” Conference Report, April 1968, online at scriptures.byu.edu. See Nathan Waite, “A School and an Endowment,” in Revelations in Context: The Stories Behind the Sections of the Doctrine and Covenants (Salt Lake City, UT: The Church of Jesus Christ of Latter-day Saints, 2016), online at lds.org. See Matthew J. Grey, “‘The Word of the Lord in the Original’: Joseph Smith’s Study of Hebrew in Kirtland,” in Approaching Antiquity: Joseph Smith and the Ancient World, ed. Lincoln H. Blumell, Matthew J. Grey, and Andrew H. Hedges (Salt Lake City and Provo, UT: Deseret Book and Religious Studies Center, Brigham Young University, 2015), 249–302; John W. Welch, “Joseph Smith’s Awareness of Greek and Latin,” in Approaching Antiquity, 303–330. See Book of Mormon Central, “Did Ancient Israelites Write in Egyptian? (1 Nephi 1:2),” KnoWhy 4 (January 5, 2016). See Neal Rappleye, “Learning Nephi’s Language: Creating a Context for 1 Nephi 1:2,” Interpreter: A Journal of Mormon Scripture 16 (2015): 151–159. Brant A. Gardner, “Nephi as Scribe,” Mormon Studies Review 23, no. 1 (2011): 46. See also, Anita Wells, “Bare Record: The Nephite Archivist, The Record of Records, and the Book of Mormon Provenance,” Interpreter: A Journal of Mormon Scripture 24 (2017): 102–106. Gardner, “Nephi as Scribe,” 47.
and Precious Persuading from a Prophet of God,” Journal of Book of Mormon Studies 6 no. 2 (1997): 67–98. For examples, see Bruce J. Boehm, “Wanderers in the Promised Land: A Study of the Exodus Motif in the Book of Mormon and Holy Bible,” Journal of Book of Mormon Studies 3, no. 1 (1994): 187–203; S. Kent Brown, “The Exodus Pattern in the Book of Mormon,” in From Jerusalem to Zarahemla: Literary and Historical Studies of the Book of Mormon (Provo, UT: Religious Studies Center, Brigham Young University, 1998), 75–98; George S. Tate, “The Typology of the Exodus Pattern in the Book of Mormon,” in Literature of Belief: Sacred Scripture and Religious Experience, ed. Neal E. Lambert (Provo, UT: Religious Studies Center, Brigham Young University, 1981), 245–262; Blake T. Ostler, “The Throne-Theophany and Prophetic Commission in 1 Nephi: A Form Critical Analysis,” BYU Studies Quarterly (1986): 67–95; Jared M. Halverson, “Lehi’s Dream and Nephi’s Vision as Apocalyptic Literature,” in The Things Which My Father Saw: Approaches to Lehi’s Dream and Nephi’s Vision, ed. Daniel L. Belnap, Gaye Strathearn, and Stanley A. Johnson (Salt Lake City and Provo, UT: Deseret Book and Religious Studies Center, Brigham Young University; Salt Lake City: Deseret Book, 2011), 53–69; Dana M. Pike, “Lehi Dreamed a Dream: The Report of Lehi’s Dream in Its Biblical Context,” in The Things Which My Father Saw, 92–118; Ben McGuire, “Nephi and Goliath: A Case Study of Literary Allusion in the Book of Mormon,” Journal of the Book of Mormon and Other Restoration Scripture 18, no. 1 (2009): 16–31; Val Larsen, “Killing Laban: The Birth of Sovereignty in the Nephite Constitutional Order,” Journal of Book of Mormon Studies 16, no. 1 (2007): 26–41, 84–85; Eugene England, “Why Nephi Killed Laban: Reflections on the Truth of the Book of Mormon,” Dialogue: A Journal of Mormon Thought 22, no. 3 (1989): 32–51; Matthew L. Bowen, “Nephi’s Good Inclusio,” Interpreter: A Journal of Mormon Scripture 17 (2016): 181–195. For a wide-ranging treatment of King Benjamin’s character and capabilities as a prophet-king, see John W. Welch and Stephen D. Ricks, eds., King Benjamin’s Speech: “That Ye May Learn Wisdom” (Provo, UT: FARMS, 1998). See also, Book of Mormon Central, “Why Did King Benjamin Use Poetic Parallels So Extensively? (Mosiah 5:11),” KnoWhy 83 (April 21, 2016). See John L. Sorenson, Mormon’s Codex: An Ancient American Book (Salt Lake City and Provo, UT: Deseret Book and Neal A. Maxwell Institute for Religious Scholarship, 2013), 213: “One had to be deeply schooled in relevant Mesoamerican language and lore to catch its allusions. In native priestly schools, students were taught explanations of the paintings and glyphs in the codices accompanied by interpretive commentaries that they had to learn by rote.” For more information on Alma’s priestly background, see Daniel C. Peterson, “Authority in the Book of Mosiah,” FARMS Review 18, no. 1 (2006): 164–168; Daniel C. Peterson, “Priesthood in Mosiah,” in Mosiah, Salvation Only through Christ, Book of Mormon Symposium Series, Volume 5, ed. Monte S. Nyman and Charles D. Tate Jr. (Provo, UT: Religious Studies Center, Brigham Young University, 1991), 196–199. For instance, Alma the Younger was given stewardship over the sacred Nephite records and artifacts by King Mosiah (see Mosiah 28:20) and was also chosen as the “first chief judge” among the Nephites (Mosiah 29:42). The sons of Mosiah became prominent missionaries, and the Lamanites who were converted unto the Lord were eventually named “the people of Ammon” (see Alma 27:26), being called after the leader among Mosiah’s sons (see Alma 17:18). John W. Welch, “A Masterpiece: Alma 36,” in Rediscovering the Book of Mormon: Insights You May Have Missed Before, ed. John L. Sorenson and Melvin J. Thorne (Salt Lake City and Provo, UT: Deseret Book and FARMS, 1991), 116 described the notable instance of chiasmus in Alma 36 as a “masterpiece of composition” and declared that its “sophistication as a piece of literature definitely shows Alma’s skill as a writer.” For more examples of Alma’s literary and teaching abilities, see Book of Mormon Central, “Why Did Alma Repeat the Lord’s Name Ten Times While in Prayer? (Alma 31:26),” KnoWhy 139 (July 8, 2016); Book of Mormon Central, “Why Did Alma Use Creation Imagery in His Sermon on Faith? (Alma 32:40),” KnoWhy 140 (July 11, 2016); Book of Mormon Central, “Why Was Alma Converted? (Alma 36:21),” KnoWhy 144 (July 15, 2016). See Book of Mormon Central, “Did Alma Counsel His Sons During the Passover? (Alma 38:5),” KnoWhy 146 (July 19, 2016); Book of Mormon Central, “Why and How Did Alma Explain the Meaning of the Word ‘Restoration’? 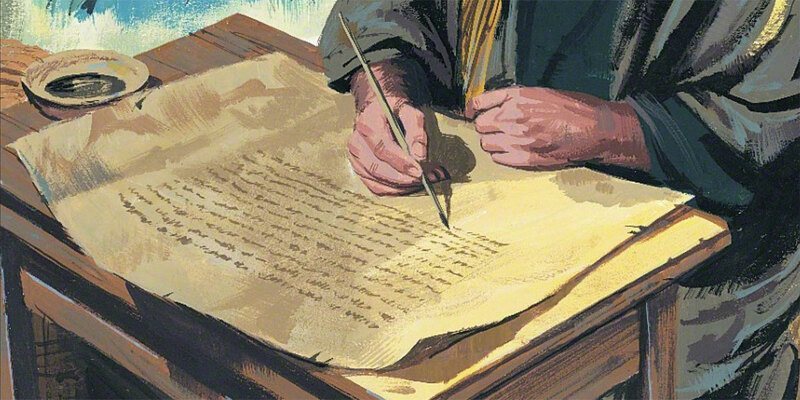 (Alma 41:1),” KnoWhy 149 (July 22, 2016); Book of Mormon Central, “Why Does Alma Mention ‘the Plan’ Ten Times in His Words to Corianton? (Alma 42:13),” KnoWhy 159 (July 25, 2016). See John W. Welch and J. Gregory Welch, Charting the Book of Mormon: Visual Aids for Personal Study and Teaching (Provo, UT: FARMS, 1999), chart 16 and chart 17 to review Alma the Younger’s prophetic successors. See Book of Mormon Central, “What Do We Know about Mormon’s Upbringing? (Mormon 1:2),” KnoWhy 226 (November 8, 2016). Earlier in Doctrine and Covenants 88, the Lord had encouraged the Saints to learn of “things both in heaven and in the earth, and under the earth; things which have been, things which are, things which must shortly come to pass; things which are at home, things which are abroad; the wars and the perplexities of the nations, and the judgments which are on the land; and a knowledge also of countries and of kingdoms” (v. 79). N. Eldon Tanner, “‘Ye Shall Know the Truth’,” Ensign, May 1978, online at lds.org.